A meteor shines during the 2016 Perseid meteor shower, captured over Spruce Knob, West Virginia. The stunning Perseid meteor shower's peak will appear in skies across the country this weekend, so head to the darkest place nearby and enjoy the show. Meanwhile, I'm traveling to perhaps the best location to watch the shower: the recently accredited Central Idaho Dark Sky Reserve. The Perseids reliably occur every year in mid-August as Earth passes through the debris trail left by the Comet Swift-Tuttle. This comet is the largest solar system object that repeatedly passes close to Earth, according to NASA. It completes a full orbit every 133 years. The meteorites from the comet's trail appear to come from the constellation Perseus, which lends the shower its name. Situated in the heart of the country, the Central Idaho Dark Sky Reserve became the nation's first gold-tier dark-sky reserve last December. The reserve encompasses land in the Sawtooth National Recreation Area, as well as some urban area to the south whitch includes the cities of Sun Valley and Ketchum. We're headed to Ketchum, which itself became the state's first dark-sky community last October. The impact of light pollution is not linear, according to writer and natural navigator Tristan Gooley. So, traveling just a few miles from a bright, urban center can make a world of difference for skywatchers. "The impact doubles as you get 12 miles [19 kilometers] closer, from 62 miles to 50 miles [100 to 80 km], but it goes up by a factor of more than 5 as you near from 12 miles to 6 miles [10 km]," Gooley wrote in his book "The Lost Art of Reading Nature's Signs" (The Experiment, 2015). The 2018 Perseid meteor shower will peak overnight on Aug. 12 and 13.The meteors will appear to radiate out from the constellation Perseus in the northeastern sky. In Idaho, we'll have the benefit of 1,416 square miles (3,667 square km) of reduced light levels, and a weekend forecast for clear skies will further diminish the glow that would otherwise scatter from clouds and airborne pollution. We'll meet with local experts to watch the event and learn more about how the people of central Idaho plan to preserve the dark night sky. So, after you've enjoyed the meteor shower yourself, join us for photos from Idaho and more about the dark sky reserve. Editor's Note: Harrison Tasoff is heading to the Central Idaho Dark Sky Reserve on an invitation from Chevrolet as part of an unpaid media preview event highlighting the Chevrolet Bolt EV and the 2018 Perseid meteor shower. 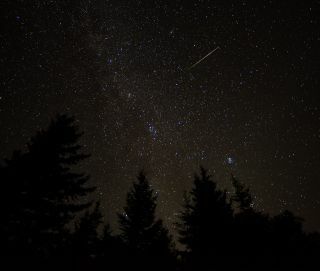 If you snap an awesome photo of Perseid meteors that you'd like to share with Space.com and our news partners for a potential story or gallery, send images and comments to spacephotos@space.com.